They do it because they are forced to do it or they don’t get paid. Its not as if every CRM vendor does not know this — they all do. I have worked for 2 of the largest CRM players in the market and we all knew what the challenge was so we worked hard to make the CRM beautiful, and mobile, and social, and cloud. What if we could make the CRM disappear? What if you started with the tool sales people already use the most and spend their lives in — email. And build the functionality right into the world’s fastest growing email product: GMail. The ProsperWorks team launched the product and has gained amazing momentum. In our diligence, we compared the revenue and growth to some of the fastest growing SaaS startups in year 1 and year 2 of their lives — like Salesforce, Marketo and Zendesk — and found ProsperWorks was on to something epic. We wanted to dig deeper into what was fueling this growth over and above a winning product that customers love — with 4.8/5 stars on G2Crowd. The key to their growth was focus. A startup must decide what it wants to do insanely better than the incumbents. 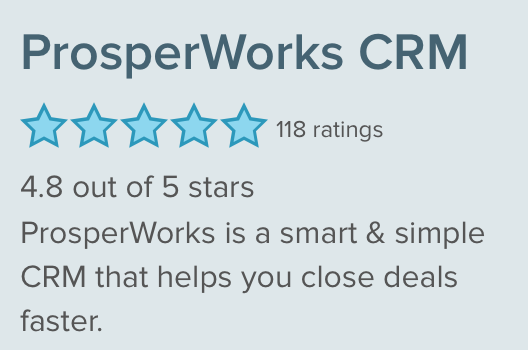 Jon chose to focus on Google and making ProsperWorks the best CRM for Google Cloud customers. Every CRM company pays lip service to email integration. Just go to any of these leading CRM companies websites and review forums and you will see a litany of broken connectors and widgets that work half the time if at all. By choosing to focus on Google Cloud, the team made a brave but strategic choice. ProsperWorks is one of six apps recommended by Google Cloud, and Google itself is a customer. As an investor, I am convinced Google Cloud — apps and platform — is growing fast and is on the cusp of an even bigger break out. The Google Apps for Work as its popularly known has been reported to be a multi-billion dollar business for Google, and growing fast. At Storm Ventures, we believe Google Cloud under the new leadership of Diane Greene will continue to be an ecosystem where new leaders will emerge. ProsperWorks has an amazing head start for companies that are betting on the Google apps and cloud ecosystem and with this infusion of $24M, I am excited to see what we can do in the next 10 years.